Initially, solid and liquid wastes were disposed and poured out onto the streets and in the courtyards of medieval towns and villages. The unpaved streets and paths were filled with mud, particularly after a strong rainfall. Since domestic animals also lived in these areas, the mud was mixed with solid and liquid faeces. 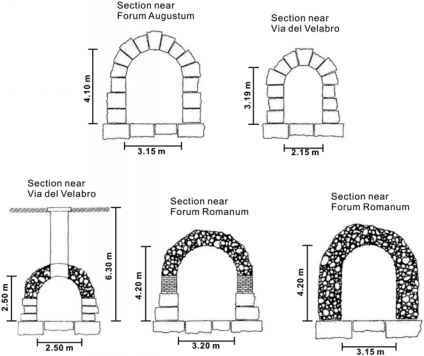 This situation went unchanged until the first regulations were issued by local authorities (Hösel 1990). In the 16th and 17th centuries in Berlin, regulations by the Elector and the town council were mostly limited to the sweeping of solid wastes and the formation of heaps. In the 18th century, many tenants who had no toilets in the courtyards still emptied their chamber pots onto the streets. The town council of Berlin forbade this by levying a fine and defining a list of places on the river Spree where chamber pots could be emptied at a certain time of day. After 1830, more and more wastewater channels were constructed, some of them laid underground, some of them as open channels directly near the sidewalks. These were frequently clogged and wastewater could not flow, especially during and after rain or snowfall. In the 19th century, it was forbidden to empty chamber pots into the Spree. Obviously, this law was difficult to enforce (Fig. 1.14; Hösel 1990). Until the second half of the 19th century, it was common practice to discharge wastewater into the rivers; and it was normal for the communities downstream to have to put up with the polluted water (Driewer 1999). These problems increased dramatically as industrial development took off in the fast-growing cities. In order to avoid epidemics such as cholera and typhus, laws had to be issued for the treatment and discharge of wastewater. Fig. 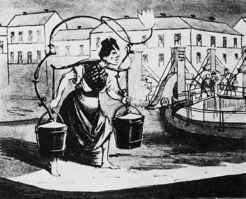 1.14 Berlin: secret emptying of chamber pots into the river Spree. The gases of anaerobic processes (mainly CH4) were used to provide light for the woman during her nightly job. Caricature by Doebeck, dated 1830 (Hösel 1990). 1931), because about 80 single regulations had to be unified which were each valid for only one of the 80 regions of Prussia. This fulminous work of about 1600 pages addressed such problems as ownership rights to waterways and lakes, usufructs, duties for the maintenance of the waterways and the banks as well as flood protection. Limits to volume or concentration of wastewater discharged into surface waters were not fixed. Similar laws were in effect in all German states and were not fundamentally changed until 1945. • They were passed separately under different conditions in the Federal Republic of Germany (FRG) and in the German Democratic Republic (GDR). • On 1 March 1960, the Water Resources Policy Act (WRPA) was issued in the FRG; and on 7 April 1963, the Water Act (WA) was issued in the GDR. • The WRPA was a legal framework in the FRG, supplemented by the legislation of the individual states. • The WA was a uniform regulation valid in all states. An important development of the legislation of the FRG was the structure of the "Law governing the payment of fees for disposing of wastewater in surface waters" ("Gesetz über Abgaben für das Einleiten von Abwasser in Gewässer", Abwasserabgabengesetz [AbwAG], from 13 September 1976), which took effect on 1 January 1978. The levying of fees began on 1 January 1981 and only covered the direct discharge of wastewater into surface waters (Direkteinleiter). So-called load equivalents (Schadeinheiten) are calculated according to the yearly disposal load of particular substances (Berendes and Winters 1981). One load equivalent (the untreated domestic wastewater produced by one person in one year) was valued in 1986 at DM 12 ( ; 6 €) and in 1986 at DM 40. Further developments of the AbwAG are described in the appropriate literature.